In the field of dentistry, diagnosis includes all measures that help to recognize diseases of the teeth and gums, as well as dysfunctions of the jaw articulations. Dental caries (tooth decay) is one of the most common of all disorders, second only to the common cold. It usually occurs in children and young adults but can affect any person. It is the most important cause of tooth loss in younger people. Bacteria are normally present in the mouth. The bacteria convert all foods-especially sugar and starch-into acids. Bacteria, acid, food debris, and saliva combine in the mouth to form a sticky substance called plaque that adheres to the teeth. It is most prominent on the grooved chewing surfaces of back molars, just above the gum line on all teeth, and at the edges of fillings. Plaque that is not removed from the teeth mineralizes into calculus (tartar). Plaque and calculus irritate the gums, resulting in gingivitis and ultimately periodontitis. The acids in plaque dissolve the enamel surface of the tooth and create holes in the tooth (cavities). Cavities are usually painless until they grow very large inside the internal structures of the tooth (the dentin and the pulp at the core) and can cause death of the nerve and blood vessels in the tooth. If left untreated a tooth abscess can develop. Plaque and bacteria begin to accumulate within 20 minutes after eating, the time when most bacterial activity occurs. If plaque and bacteria are left on the teeth, cavities can develop and untreated tooth decay can result in death of the internal structures of the tooth and ultimately the loss of the tooth. Parodontosis is a chronic disease of a parodontium, i.e. bony wall of a dental sac (alveolus), periodontium and gingiva. It produces gradual and continuing destruction of the wall of alveolus and supporting periodontal ligaments. Thus the consistency of teeth is impaired, which causes their shakiness and leads to their elimination. This disease affects especially people of middle or old age, but recently it occurs also with individuals around 20 years of age. The inflammation of parodontium, which are tissues fixing teeth in the jaws and at the same time protecting this fixation before undesirable impacts of an outside environment, is the initial stage in the development of parodontosis. Starting minor gingival bleeding is an apparent sign of this disease. The recession of gums, exposition of necks, their increased sensitivity and risk of dental decay are the consequences of this impaired condition of parodontium. The periodontal pockets develop followed by damage of dental cement, liquidation of ligaments and bones and finally shakiness of teeth and their shedding. To have healthy teeth for life! We would like your teeth to remain healthy so that you will be able to smile with your own beautiful teeth for a whole lifetime. That’s why we take advantage of the opportunity of working hand in hand with you. Everyone should perform their role in dental health with a sense of responsibility. Tiny electrodes numb the tooth so that drilling-related pain is not a problem. The patients control the level of anaesthesia themselves. A soft tickling instead of a needle! All required denture work is explained to the patient prior to the commencement of the procedure in detail with the aid of short animations or films. These films can be watched by the patients in our surgery on a laserdisc system. It is also possible for patients to borrow videos on the same subject. The typical “dentist’s surgery smell” is believed to be unpleasant. Our subtly balanced aroma system provided by the company Voitino helps to remedy this. 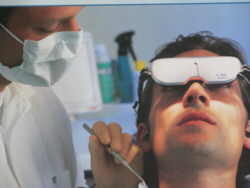 Longer stays in the dentist’s chair can be used to watch a feature film or short film during treatment, with the aid of the Olympic-Eye-Track glasses. The picture and stereo sound are transmitted wirelessly to the display of the glasses. Our assistants are always motivated to be at your side, even with comforting gestures. Dentistry today can do more than just “repair”. First of all, all dentistry treatment measures must restore the functionality of the masticatory organ and maintain it in the long term. Apart from the solely functionally-oriented therapy, the aesthetic aspects of dental reconstructions also play a decisive role, since our teeth, as an important part of our face, are also part of the individual personality of everyone. Beautiful teeth have always been, and will remain, a synonym for health, attractiveness and success. Beautiful teeth confer liking, self-confidence and assurance. Many of the therapies described on the pages of our website (fillings, dentures) are in essence both functional and aesthetic therapies. We strive to give your teeth a more beautiful appearance – even by using minimally invasive techniques. Use the correct teeth brushing technique. Are you aware of the advantages of electric toothbrushes? Toothpaste is not just toothpaste. Hygiene measures are important complements.